Starting in the late 60’s and on through the 70’s Toronto became a northern hot bed for a burgeoning reggae scene as a large influx of Jamaican residents shaped their own music culture there. Light In The Attic records has been releasing a series of records under the Jamaica To Toronto moniker chronicling the amazing classic sounds emanating from there. 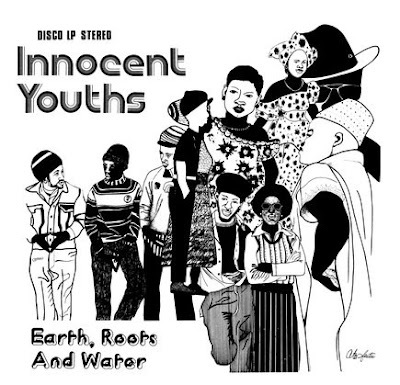 Earth, Roots and Water‘s Innocent Youths is the seventh and final record in that series. Originally pressed in 1977 it’s long been out of print and extremely hard to find. It’s a lost classic of soul infused reggae perfect for just kicking back and chilling out to. Earth, Roots & Water was initially formed in the mid-seventies to provide hard rhythms and tight backing tracks for the growing number of musical friends and family who ventured to Jerry Brown’s Malton, Ontario, basement studio. Over the years, a veritable who’s who of Jamaican music scene passed through Summer Sound to record with like-minded brethren. Jackie Mittoo, Willi Williams, Johnny Osbourne, Carl Dawkins, Leroy Sibbles, Stranger Cole, and King Jammy are just a handful of the label’s impressive roster. By 1977, Earth, Roots & Water had developed into an engaging live entity as well, based around the talents of Adrian “Homer” Miller (vocals), Anthony “Base” Hibbert (bass), Colin “Zuba” Suban (drums), Matt Shelley (guitar), and Tony “KB” Moore (keyboards). Both a sonic and visual force, the charismatic youths soon found themselves performing in and around the Toronto area, opening up for The Police and The Stranglers while extending the UK-born punk/reggae love affair to North America.